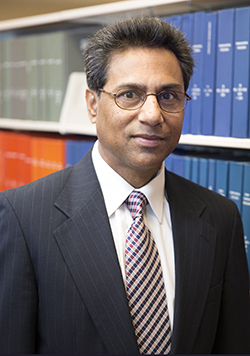 Subimal Datta, PhD, who is recognized as one of the world’s leading experts on the neurobiology of sleep and cognitive neuroscience, has joined the new Anesthesiology neuroscience research team as Professor of Anesthesiology. In collaboration with Ralph Lydic, PhD, and Helen Baghdoyan, PhD, Professors and Co-Directors of Anesthesiology Research, research led by Dr. Datta aims to understand disorders such as insomnia, addiction, depression, and different types of anxiety disorders (including PTSD). Understanding the cellular, neurochemical, and molecular mechanisms underlying regulation of REM sleep and processing of different types of memory, including emotional memory, during different stages of sleep and wakefulness have been the main focuses of Dr. Datta’s research to date. Dr. Datta will continue his innovative research through a grant from the National Institutes of Health totalling $1,385,000. His work has been continuously funded by NIH research grants since 1995. His studies have also been supported by research funding from the pharmaceutical industry. UT Graduate School of Medicine Dean James Neutens said, "As an acclaimed researcher in his own right, Dr. Datta is definitely an asset to the exisitng Anesthesiology research team of Dr. Lydic and Dr. Baghdoyan, and we anticipate this team will conduct groundbreaking research toward a deeper understanding of how the brain works." Dr. Datta holds joint appointments with the University of Tennessee in the Department of Anesthesiology at the UT Graduate School of Medicine and the Department of Psychology at UT Knoxville, further strengthening an existing environment of close collaboration among two campuses. Most recently, Dr. Datta was Professor in the Departments of Psychiatry and Neurology, the Director of Sleep and Cognitive Neuroscience Research laboratories, and an Associate Director of Clinical Sleep Medicine Fellowship Training program in Boston University School of Medicine. At Boston University School of Medicine, Dr. Datta and his team of researchers identified an intracellular signaling enzyme that regulates the wake-sleep cycle, which could help lead to the development of more effective sleep aid medications. The results of the study point to a specific enzyme inside neurons in the brain that trigger an important shift in consciousness from sleep to wakefulness and wakefulness to sleep. Dr. Datta has authored and co-authored numerous chapters and scientific publications. He is the Associate Editor of Sleep and of Frontiers in Neuroscience and serves on the editorial board of several additional professional journals. He serves regularly in the review committees of several national and international scientific funding agencies. Dr. Datta earned his doctorate degree in human physiology and neuroscience from All India Institute of Medical Sciences and completed Postdoctoral training in Neurophysiology at Laval University School of Medicine and at Harvard Medical School. The Department of Surgery at the UT Graduate School of Medicine has added a Division of Transplant Surgery to its residency program. While General Surgery residents in their second and third years have had exposure to transplantation before, the dedicated rotation allows residents unique exposure and in-depth educational experience in a subset of patients with high complexity as well as exposure to the immunologic and infectious disease aspects of the care of a transplant patient. "The medical and surgical complexity of the transplant recipients makes the rotation an excellent educational opportunity for residents ..."
Oscar Grandas, MD, Chief and Associate Professor, Surgery’s Division of Transplant Surgery, said, “Not all residency programs have transplant rotations. The medical and surgical complexity of the transplant recipients makes the rotation an excellent educational opportunity for residents because they can learn medical management of complex patients and public policy associated with organ allocation in addition to surgical techniques. The Division of Transplant Surgery provides opportunities for resident participation in the diagnosis, evaluation, and surgical management of patients with end stage renal disease in need for kidney transplantation. 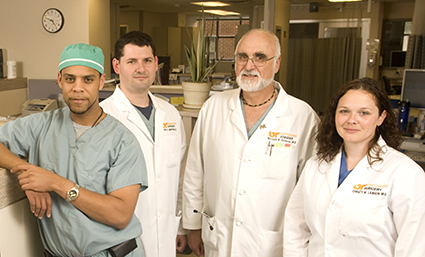 The division consists of three full-time transplant surgeons. In addition, there are three minimally invasive surgeons from the divisions of General Surgery and Urology that also participate in the living donor procedures. The Transplant Center at the medical center performs approximately fifty kidney transplants a year and actively participates with the United Network for Organ Sharing in the Scientific Registry of Transplant Recipients. Residents participate in all surgical aspects associated with organ donation and transplantation. The residents’ primary responsibility is the care of the kidney transplant recipients, to lead the multidisciplinary transplant rounds and to participate in deceased donor, live donor and transplant recipient surgeries. Residents also perform vascular access procedures while on the rotation. Learn more about the Transplant Surgery rotation.